Sunderland 0 – 1 Newcastle – Move. Run. Sports. From kick off we looked a little bit nervous and needed to try to calm down a little. Losing the ball straight from kick off was not a very good start. But as the time went on we got more into the game and managed to pass the ball around well. The main problem we seemed to have in the first half was not picking up Stephane Sessegnon, who was causing us all types of problems. Constantly finding himself in plenty of space and plenty of time to get a shot (or pass) away. He did have quite a few efforts in the first half. The main talking point of the first half had to be the massive penalty shout when from a corner, Shola Ameobi headed it goal-wards and then Joey Barton’s header was going right in the top corner until the arm of Seb Larsson. 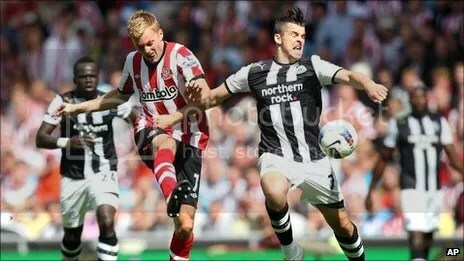 This would have seen a penalty awarded along with the Sunderland man sent off! But Howard Webb and his assistant did not give the pen and instead gave us a corner. The second half started in a similar way to the first with both teams giving the ball away rather easily. It was a very scrappy game and the tackles were flying in at times (which is always expected in a derby). Leading to quite a lot of bookings and eventually a sending off, it was never going to stay 11-a-side with the first booking very early on. Phil Bardsley was the player to have an early bath after an awful tackle on Coloccini in the last ten minutes. But the moment of the match came in the 62nd minute, after some good play from Jonas Gutierrez causing problems down the left hand side of the pitch. He won a free kick and up stepped Ryan Taylor. We all know about his free kicks as he scored a few against us before we signed him and yes he got another one today, but this one is special. It will have his name down in Geordie folk law for years to come. We love a free kick against the Mackem’s . . . think Liam O’Brien and Emre! But after taking the lead this resulted in feeling even more tense for the rest of the game, especially in the last 10 minutes when it really was edge of the seat hoping that we would be able to hold on to the win. Which we did! Phil Bardsley’s sending off in about the 82nd minute for his challenge on Colo. It always looked like someone would be sent off with the tackles flying in. Overall I was very proud of the effort the players put in and really looked like a team, the spirit of the day and the spirit which appears to come from the dressing room despite all of the negative talk with players leaving and not spending any money on replacements. Yohan Cabaye really impressed today playing a little bit higher up the pitch than he did against Arsenal last week. Cheik Tiote missing parts of pre-season due to his visa has been shown in the past two games, but that match fitness is something that he will get back very soon. 3 points against Sunderland is always a brilliant thing to have in a derby game, gives us all bragging rights for a while. Let’s hope we can move onwards and upwards bringing in some new faces to help with our very small squad. A while to go until the next derby game, let’s use this game as a stepping stone! Another thing I loved seeing the players throwing their shirts into the travelling Toon fans, who we could hear very well during the game! Just shows that they really do appreciate the support we give the club. Just a nice gesture to end a good day to be a Newcastle United supporter! Howay the lads! ‹ PreviousJose Enrique Speaks Out!